I don’t particularly like January. There is something about new resolutions and promises that seems insincere to me: I’m not good at keeping them. The reality of returning to school and work, though I like these, stands in stark, dark contrast to the light and warmth of the Christmas season. January puts me in mind of a winter scarf that I once loved. My parents gave it to me for Christmas when I was in ninth grade. I wore that scarf waiting for the bus, and while waiting was not a new experience, waiting alone, without at least one of my seven siblings, was. The reality of “going it alone” after such wonderful days of “at homeness” brought a surprising and unexpected wave of homesickness — even though I could look from the bus stop and see my house. So, I continued to wait for that bus and buried my chin in that new scarf, conscious of the warmth that the memory of “belonging” brought. This January, instead of making a resolution, I am taking a different tack: I’m trying to look at whatever I am avoiding and, with God’s grace, seeing it and facing it in a new way. January seems like a good time to face my use of time. Too often, I regret the past or worry about the future and consequently miss the present. If I could be thankful for time, really thankful, then perhaps I could use it as God intended. In his “Confessions,” the early medieval philosopher St. Augustine writes beautifully of time, admitting that he knows what time is — until he needs to explain it. He speaks of thinking of time but always in terms of the present. Thus, according to Augustine, memory is the present consciousness of the past; future is the present expectation of things to come; and the present is awareness of the now. “Late have I loved You,” Augustine prays. May I have a portion of Augustine’s awe of and reverence for time. So here’s the new tack: to be thankful for all time — past, present and future, and to find God in it. That memory of a scarf and the bus stop is a good starting place. Recognizing now my delight in recalling that past gift, I’m abandoning the fleeting thought that I didn’t thank my parents sufficiently. I thank You, God, (present) that someone, Mom, remembered my favorite color and knew that waiting at the bus stop would be cold (past). Remind me (future) that with You, I am never alone, and that time, Your time, never ends. Amen. 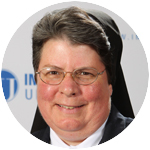 Sister Judith Parsons, I.H.M., is an associate professor at Immaculata University. Amen Beautiful reflection and I hope to continue reflecting on it. God is never late; let’s praise Him while we wait. Happy New Year. Beautifully written. I will reflect on this, I am always doing things to get ahead, I never do and miss what is going on to enjoy.